Welcome to the sixth and final part of our Presenting Your Best Self series. This last section is all about presenting your best self through solid communication. A common question I receive from merchants is, “How can I keep my Affiliates engaged and active in the program?” Answer: Keep them in the loop! Utilize the newsletter tool to maintain consistence communication with your Affiliates. The key is to keep your newsletter relevant and concise. Your efforts will have adverse effect if you begin spamming your Affiliate base. Strive to put together at least monthly newsletter that contain relevant information about what is new with your site and the program. Think of the newsletter as your marketing toolkit for Affiliates. Include informative details that will help your Affiliates to better sell or market your product or service. For most programs, monthly will be a fitting schedule. If your program offers a huge inventory with lots of details changing on a regular basis, it may bode well for your program to send more frequent newsletters. Include items that Affiliates can put right to use. “Actionable” as in useable. Utilize macros to include the Affiliate’s specific tracking code for tools and to personalize your email. Let the newsletter reflect who you and your company are. 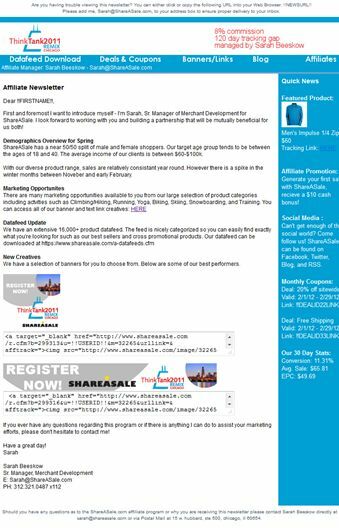 Affiliates receive hundreds of emails – might as well make yours interesting to read. In the newsletter tool, merchants have the option to create either a plain text or HTML newsletter. Either can be very effective. Personally, I prefer HTML for the monthly newsletter so I can use a template and include images and general branding. Text can be great for quick short updates. Utilize the filters to send specifically targeted communication to certain groups of Affiliates. For example, you could send keyword lists to your PPC affiliates, an activation newsletter to low performers with some tips on getting started, special incentives to your top performers, content tips to your bloggers,…you get the picture. What to Talk About in Your Newsletter? Highlight recently added or updated banners, text links, videos, and widgets. Include a few sample products of what is new and hot in your inventory. Let your Affiliates know what the audience is for your website. The more the Affiliate knows about who is shopping at your site and for your products, the better they can target their site as well. Include any Affiliate sales incentive or bonus campaign that is running. This can be a great opportunity to encourage Affiliates to generate sales or push a specific product. If you have product inventory, include content about your products or brands. Use this as an opportunity to education people on what makes your products unique. Communicate any coupons or deals that are currently available. 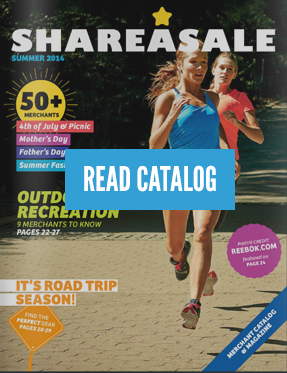 Be sure to also upload these to the ShareASale Coupon & Deals database as well. I have such a hard time getting my sites to rank in the search engines with the data provided in the datafeed from shareasales. Anyone with the similar problem? Thanks for this. I just sent out our first newsletter yesterday. Hopefully it is well received. Thanks for the impressive final part of Best Self series. I have been dying for it. :). Looking forward to more helpful tutorial here on this site. Keep up continue. Just updated the way I send my newsletter. Yet to see what is the outcome. But I will come back and post the updates. Thanks, this is going to help me become more profitable and help other people at the same time. Glad there is such great training tools here.